The quote on the front page says that this issue is similar to Hellboy and Adventure Time, but to be honest, it wasn’t funny at all, instead very serious and almost grim. So I do not see the tie to Adventure Time. 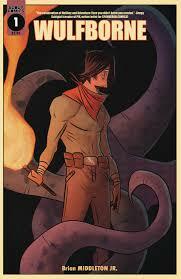 The story starts off with main character (just a regular looking dude) in a fight with an aquatic looking creature. He kills it with his sword by decapitating it. Soon afterwards something calls to him from a cave, and he goes to it because it promises to heal his broken heart. Another monster confronts him at the cave, warns him that he should not continue and nothing will be as it seems. The monster explains that it was trapped there after a witch stole his strength. The main character enters the cave, ignoring the advice, but appreciating it. Then the story ends there, to be continued in the next issue. The book is a setup for the next issue, period. It had some very interesting art: all black and white. I was surprised to find that I liked the art since I am not normally crazy about black and white comics. I did like the way the book set things up. It seems as if it will be a good story. There isn’t a whole lot that happens in the book, but it is still interesting. Not a whole lot of conversation though, I personally didn’t like that, although, it’s probably best it stays that way because we don’t need talking in our fighting. If you aren’t into slower stories then don’t pick it up, because it is a little slow, even with all the fighting, staying on the same scenes for too long. This book starts out aggressively with an alien race being nearly wiped out, with only one survivor. The main antagonist is the one who caused it all, and it is all in order to take the energy out of living beings in order to have necromantic power. The story moves to Earth where a few characters are introduced, and they go through their daily lives. The main antagonist, now with an army of the people he just killed, comes from a portal and attacks a character from Earth because she thinks that he is immortal. I won’t spoil the ending just in case you decide you want to run down to your local comic store, but that is the gist of what happens. This book is not bad, but it also isn’t awesome. It may be good for people who play stuff like Dungeons and Dragons as is seems to take place in the past and there’s a big magic aspect to it: necromancy and such. The story isn’t very difficult to follow, but a lot happens in this one issue. I did like the art in this issue, it was very detailed. The most detail went into the faces; the artist clearly took his time on that. It was colorful in the beginning but then it went darker, being in a forest and all. But there was still a good amount of color splashed on the pages of the second half though. 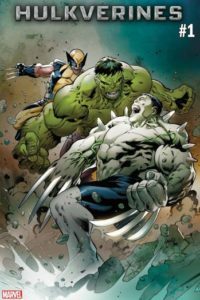 This is exactly what a reader would expect from a story that combines the awesomeness of Hulk with the ferociousness of Wolverine. In essence, Hulk and Hulkverine (aka Project H…yeah, I didn’t know either. Look it up on Wikipedia; I had to) battle, and as expected… it’s freaking awesome! Honestly, I would have been totally fine with just a book filled with the art in this issue, most of the thrill came from the fight scenes; dialogue was almost secondary. Don’t worry though, although the plot is lacking, the art more than makes up for it. From the start, the color is popping, introducing scenes that are an absolute pleasure to look at. The character art is really detailed, and allows the their individual personalities to really shine. Easily the most impressive facet of this issue is the return of Leader, who in his typical green brilliance, has only one goal: to kill the Hulk once and for all. The dialogue felt somewhat rushed and not well paced. Didn’t really make a difference, could have been replaced with gibberish and I wouldn’t have cared. Worth picking up, even if it is just to praise the artwork. Not what I expected… but exactly what I needed. Let’s start of with the awesome character Kurt Wagner, a mutant whose teleporting, wall-clinging powers rival the greatness of this first issue. He’s the world’s most famous mutant, and his daily life corresponds with his celebrity status. He’s blue, friendly, and speaks with a fun German accent: what else do you really need to know?? 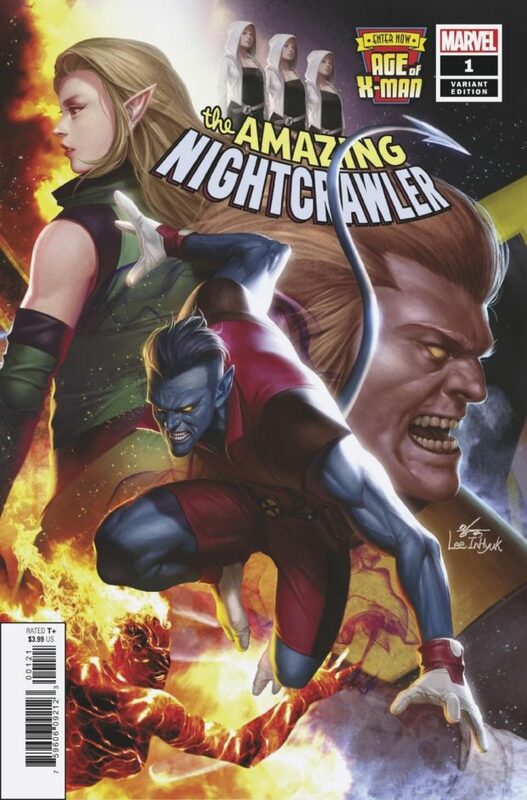 When I first picked it up, I totally thought this issue was going to be Nightcrawler’s origin story. To my surprise, not only is it not about his backstory, it seems to represent him much further in his life, seemingly taking place after his time with the X-Men. He’s basically the Johnny Depp in this mutant version of hollywood; yes, he’s an actor in a television series. The artwork is perfect for Nightcrawler: it is very clean and creates an atmosphere that conveys the character’s emotions and thoughts. At some points, I actually stopped reading just to admire the art. The character’s faces and body postures are extremely detailed, and the costumes are well drawn. 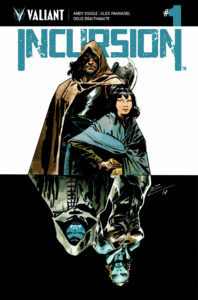 The variant cover is animated and action filled, one of the best I’ve seen. The dialogue in this issue is actually fun to read, and feels extremely well paced. Definitely worth the price, would make a good addition to anyone’s collection! For the Best of the Week, I’m going to go with the students’ reaction to this week’s books and say Nightcrawler wins, giving Marvel yet another point. I was excited by the amount of non-Marvel books out this week, but even the stuff I read didn’t seem to come close to Sam’s excitement for this new Nightcrawler title. Marvel takes the lead!